Just wondering if many of these big signs have been seen in museums or private collections. Sign measures 3 feet by 10 feet at the widest points and looks like the one in the photo submitted by Herb Iffrig on May 14th. This sign was found in Alberta, Canada this past summer. Nice! I have never seen one that large in person. Only a couple in photos. I bet that is worth some money. I expect it's pretty rare. 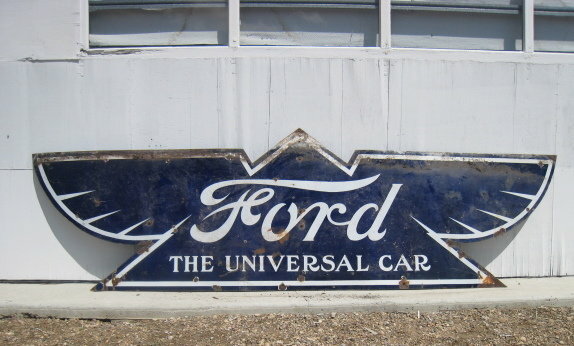 It's only in recent decades that the value of old signs has zoomed. Before that most people saw no value in such a thing and would have scrapped it or used it to patch a roof or cover a hole in a barn floor. It's the scarcity that makes them so high-priced today. Was at a auction nearly 15 years ago and there was the same sign on the end wall of the barn. A good friend of mine bought it for $400.00. This was the estate sale of Fred Louks in Aldergove BC Canada. Fred collected 1909, 10 and 1911 T's and many other early brass era cars and parts. The prices were cheap overall and the best part was as Americans we paid with US money which at the time was 40% over the Canadian dollar. So everything we purchased was discounted 40%.